DOWN in the basement, Dad's playing Texas Hold Em and chatting online with DesertMissy when - blam! - someone takes off the top of his head with a Golden Boy .22. Since the final lines of his online flirt refer to the person who's just come in as "my wife... #19", it's obvious that the technologically savvy polygamist has just been done in by one of his handmaidens. And that's just the start of The 19th Wife, a bestseller in the US. How well it will do here is moot. This book is hard work, with interlinking narratives and a multiplicity of viewpoints and styles. The main narrator is sweet, gay Jordan, who grew up hard and fast when the voice of God told the ma that she should abandon him on the road when he was 14. Yes, that's the suspect, that mother #19. Jordan is determined that the ma is innocent. And so she seems. Innocent, otherworldly and totally dim - the kind who's waiting for the Rapture. 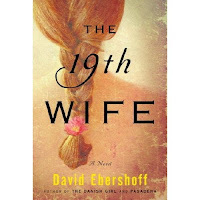 Peeking out from between the story of Jordan's investigation into his father's murder is another story - author David Ebershoff's retelling of the factual story of Brigham Young's renegade 19th wife. Hideously funny and way, way too long, this makes a perfect desultory Christmas read.